Relacore Extra Review (UPDATED 2019)– Is it Good for Weight Loss? Relacore Extra Review – Is it Good for Weight Loss? Marketed toward people that are tired of seeing their stomach stick out more than it should, Relacore Extra promises it’s users that it can have them losing that pesky belly fat with use of their product. The company claims that stress is related to fat that accumulates around the stomach and waist, so this product will help you feel better and keep that fat off. Sounds real good doesn’t it? A pill that can make your overall mood better and at the same time lose weight. 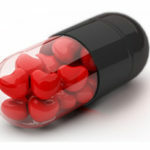 So does this pill really work? Or is this all just hype with nothing to show for it? We decided to find out. 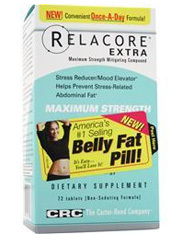 Relacore Extra claims that weight gain especially in the abdominal area may be linked to stress levels. To combat this, Relacore Extra contains various ingredients that are used to elevate the mood of the user. Included with this are various vitamins that help with overall health. While there are users who report feeling overall better, there have been a lack of people who report an actual reduction in belly fat. Relacore Extra is filled with many ingredients, making it a multivitamin at the same time as a diet pill. While there are ingredients that are beneficial to overall health, not all of the ingredients listed are known to help with weight loss. Examples of this include poria and phosphatidylserine. Other ingredients, such as Chinese skullcap, may actually cause harm to the user. This product, much like diet pills on the top 10 list, is made of all natural ingredients. Magnesium: Crucial for overall wellbeing, this ingredient may also help combat depression and diabetes. Zinc: A metal that is known to help with ailments such as night blindness, ADHD, high blood pressure among others. Calcium: Known for keeping bones and teeth healthy, there is no evidence to support that this ingredient helps with weight loss. Vitamin C: Vital for overall health, this antioxidant helps prevent oxidative stress in cells, but there is no evidence to support that it can help lower overall stress levels. May also boost metabolism. Vitamin B1: Also known as thiamine, this helps convert carbohydrates into fuel for the body. Vitamin B2: Also known as riboflavin, this water soluble ingredient helps convert food into energy. Vitamin B3: Known as a treatment for high cholesterol. Vitamin B6: Known to treat high cholesterol, as well as heart disease. Vitamin B12: Known to help boost mood, as well as energy levels. Folate: Known to help with ulcerative colitis, as well as anemia. 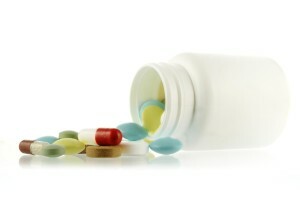 Biotin: Known to help with rapid weight loss as well as malnutrition. Pantothenic acid: While used as a treatment for a variety of ailments including depression, low blood sugar levels and nerve pain, there isn’t enough scientific evidence available to prove that this ingredient is effective. Phosphatidylserine: There is no evidence to support that this ingredient helps with weight loss. Passionflower extract: Believed to be a natural anti-depressant, results remain inconclusive as to the effectiveness of this ingredient. Magnolia extract: When included with Phellodendron this ingredient is believed to lower cortisol levels. Despite this results remain inconclusive. Also there is no Phellodendron in this product. Asian ginseng: While known to treat stress, paradoxically it is possible to induce stress with use of this ingredient. Chinese skullcap: While used in health supplements, use of this ingredient has been linked to liver damage as well as hepatoxity. Poria: While known to treat skin disorders, there is no evidence that this helps with weight loss. Perilla: Currently being studied for possible anti-inflammatory properties. Jujube extract: Believed to help reduce stress levels, as well as treat skin ailments. Use of Chinese skullcap has been linked to liver damage. Also Asian ginseng may have an unpredictable effect on the user’s mood. There are various vitamins included in this product that are beneficial to overall health. Examples of this include vitamin C, B1,B2, B3, B6 and B12. While filled with a wide variety of ingredients, this can all be seen as somewhat of a smoke screen. Some ingredients, such as the various B vitamins are beneficial to overall health. However there are other ingredients, such as phosphatidylserine, which have no relevance to helping people lose weight at all. Other ingredients that are included, such as Chinese skullcap may cause liver damage. When taking a product, it’s important to be aware of exactly what goes into it. The whole point of the diet pill is to improve your health, not to harm it. Even with everything that is included in this product, it is a bit curious to note that from all the reviews, no one has talked about actually losing belly fat. True, people may like the mood enhancing effects of this product, but the advertised claim seems to be just that; a claim. Sure this product is full of healthy vitamins and minerals, but that doesn’t necessarily mean it can help you lose weight. People might feel better overall, but as for losing belly fat, there is no evidence to support this claim. There are positive aspects to this product, such as the vitamins and mood enhancers in the ingredient list. However just because these aspects of the pill are positive, it still misses it’s main selling point; helping people lose belly fat. There are other diet pills available that can better serve this purpose. 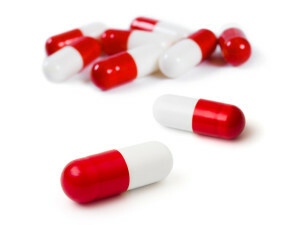 If you want to feel better and know you are taking what is essentially a multivitamin, then go ahead, but if you want to lose weight at all you might as well look elsewhere. Whats better than Relacore Extra?